Kiteboarding can be dangerous. You will be required to acknowledge that you are undertaking certain risks if you choose to have lessons with MBK. If you can not accept these risks, you should just enjoy watching...but not have lessons with MBK (or anyone else!). 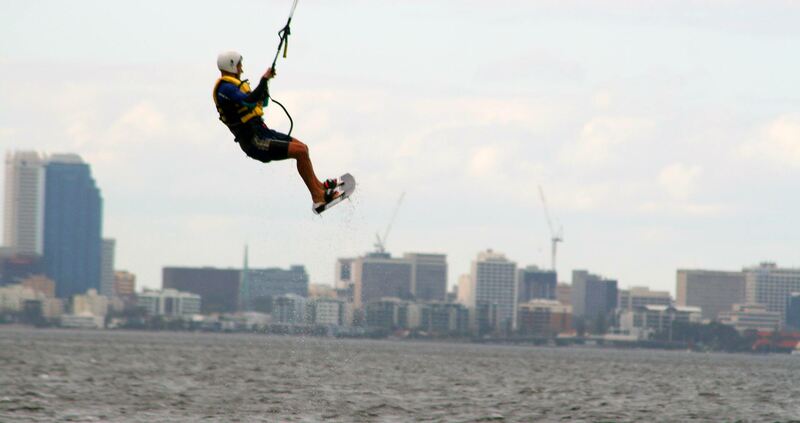 The risks of kiteboarding are either directly related to kiteboarding (eg being overpowered and pulled into something hard) or they arise from simply being in the water (eg sharks, stone fish etc or drowning). Although these risks can be managed and mitigated to some extent, they cannot be eliminated. MBK strictly adheres to KA teaching requirements. These include, for example, that any student wear a PFD (personal flotation device = life vest) when in the water and wear a helmet if using a power kite. Perhaps the most important safety advantage of MBK's KA status is that every student will only be allowed to undertake any part of the practical curriculum (eg body dragging) if his/her competence with all prerequisites (eg quick release and other safety mechanisms) has been well demonstrated. MBK emphasises use of small kites for safety. A well flown modern depowerable 6m kite in relatively light winds will give sufficient power for learning in the early stages and will, with the right board, allow many students to get up and riding in relatively modest winds. The small kite/large board approach nevertheless allows students to become accustomed to using a power kite in relatively safe conditions.